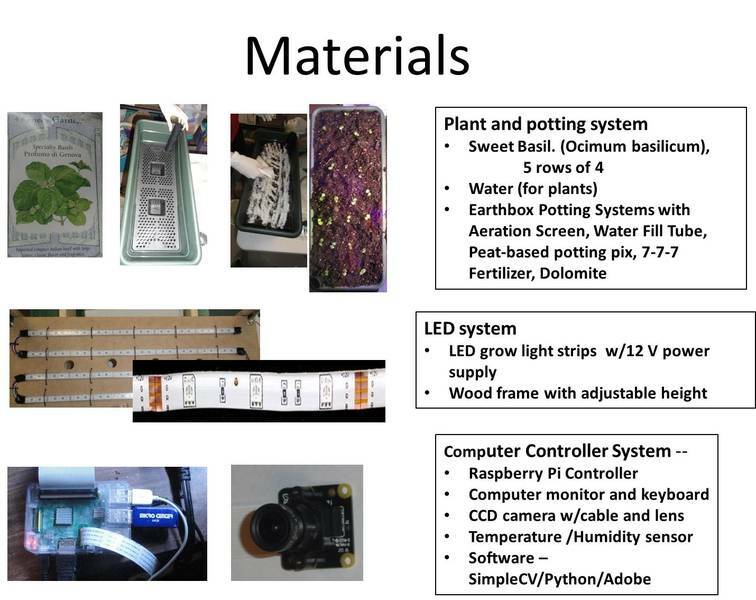 The project incorporates a digital camera, light emitting diodes (LEDs), and software image analysis tools to conduct non-contact plant growth analysis. The system measures growth parameters such as leaf size and leaf reflectance. 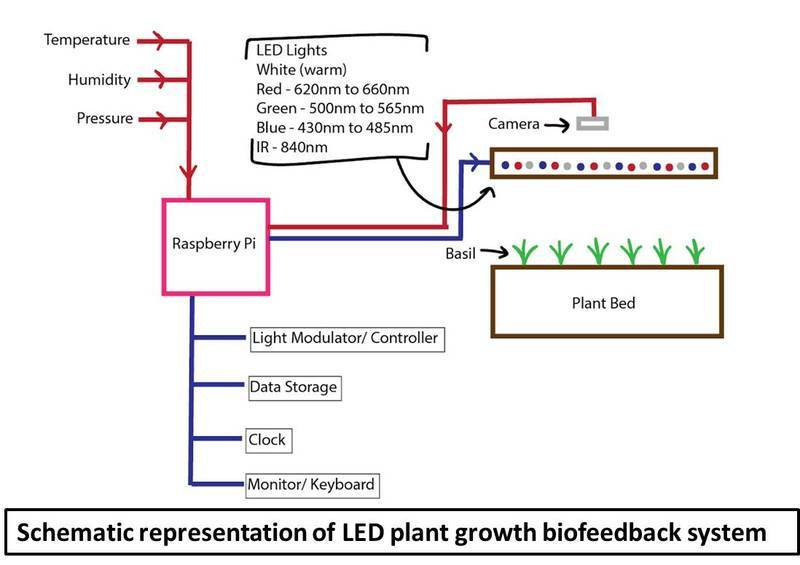 Plant growth characteristics can then be used to regulate the spectral and temporal output of the LED grow lights. The goal of the system is to provide real time feedback to optimize plant development with minimum energy. I believe this project directly relates to the climate change and food shortage challenges. Combining LED and computer vision technology creates the opportunity to develop plant light algorithms that can simultaneously improve plant yield and greenhouse energy efficiency. Attached video,https://youtu.be/Y6Vz6sSnXhY, shows computer vision measurements of a basil plant over a 30 day period. The goal was to understand computer vision performance for the LED plant measurement system. Images show the ability of computer vision to measure small features less than 1mm without contact. 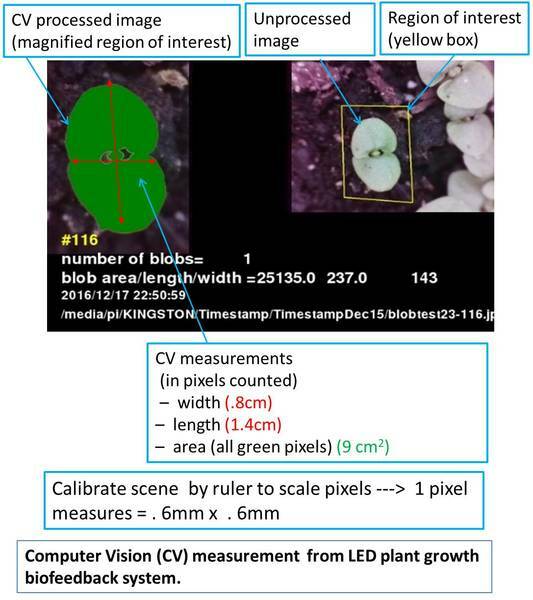 Computer vision software (SimpleCV) extracts basil plant 'blob' features from soil background and counts number of pixels in each plant 'blob'. Video info: Unprocessed Image (right), computer vision processed image (left) marks counted pixels in green. Text below displays # of pixels in area/ length/width and perimeter for each image. Images are scaled/calibrated by ruler - 1 pixel measures .6mm x .6mm. It is also possible to conduct multi spectral observations by sequencing the camera with different LED colors. The objective is to see if reflectance at different wavelengths provide useful information about plant health. Attached figure shows different images ! 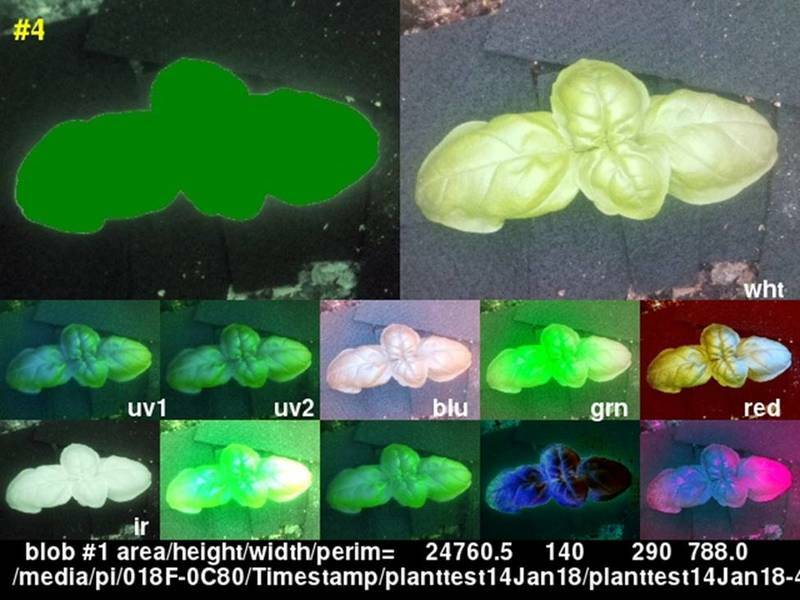 [Mulitspactral4 of the same basil plant illuminated by different LED wavelengths. Top left is a computer vision enhanced image. Top right is white light image. Images below are for ultraviolet (uv1),ultraviolet (uv2), blue(blu), green (grn), red and infrared (ir). Remaining images are processed images that highlight color contrast. Looking for collaborators to adapt raspberry pi / computer vision tech to conduct real time spatial/spectral analysis. Please respond if you are interested in applying CV techniques to real time grating spectroscopy or multi-spectral imaging systems. I did this Help out by offering feedback! Browse other activities for "multispectral-imaging"
Thanks for posting, @MaggPi, this project looks really exciting! We've linked to it on some of our social media, to give it some attention, but if there are specific questions you're hoping to work on with collaborators you might also consider breaking things up and posting to the questions page. I appreciate how well you've documented the instructions.. I've added an activity tag to help it show up with other projects that might be replicated by folks in the community. Very cool! MaggPi very interesting project. Was there a link for status/instructions? I also noticed David Prutchi of Hacketeria had an interesting multi-band polarizing imager, probably we could reach out to him. I have been researching a portable microscopic imager and spectrophotometer. I also thought about how your project could benefit from several VOC/CO2 sensors or light sensors to inform research goals. Maybe we could schedule some kind of meeting/event and discuss ideas. Would be nice if we could use the calendar on this site so that people with interest could join as well.